Oftenpatients decide to have their non-operative treatment with Dr. Boettner. The benefit is that he will be able to monitor the progress of the arthritis and will help you understand at what a point surgical intervention might be beneficial for you. Dr. Boettner performs a variety of non-operative treatment options prior to considering total hip replacement. These include exercise protocols, NSAID medications that are aimed at decreasing inflammation inside the joint, reduce pain, or supplements that will supply nutrients towards the cartilage. Dr. Boettner also performs intra-articular injections to improve the joint lubrication and to decrease inflammation and pain. The image shows bone on bone arthritis with early bone loss. Usually at this stage non-operative treatment options will no longer provide pain relief. Hip arthroscopy is a relatively new technique. It has been developed to minimally invasively address intraarticular pathologies that do not require hip replacement surgery. Conditions such as labral tears (Image A), loose articular bodies, intraarticular synovitis, or femoroacetabular impingement (FAI) (Image B) can cause pain in the joint and require the patient to seek treatment. If certain bony abnormalities or intraarticular pathologies exist and non-operative treatment options fail, hip arthroscopy does offer a minimally invasive approach to enter the joint and treat the underlying problem. Dr. Boettner performs hip arthroscopy as an outpatient procedure, under spinal anesthesia. Depending on the type of reconstruction, patients might spend a few days up to three weeks on crutches, unloading the joint. Hip arthroscopy usually requires at least four to six weeks of physical therapy and it takes at least three months to return to your sport activities. Dr. Boettner is member of the Center for Hip Pain and Preservation at the Hospital for Special Surgery. After non-operative treatment options like anti-inflammatories, intraarticular injections, activity modifications and weight loss have failed, patients with osteoarthritis that complain about persistent pain and stiffness in their hip might be a candidate for total hip replacement. Total hip replacement surgery aims at removing the diseased cartilage and replacing it with an artificial joint. Over the last four decades, the technique for total hip replacement surgery has continuously improved and total hip replacement surgery today is one of the most successful surgeries. We today usually perform un-cemented Press-Fit fixation (Image A) of the components. 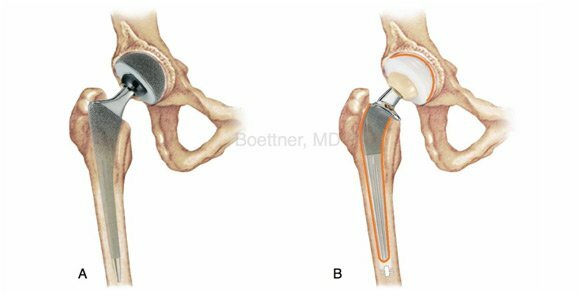 Occasionally in older patients with poor bone stock Dr. Boettner still utilizes cement for stem fixation (Image B). Implants today are made out of titanium and coated on the outside with a porous surface structure that allows the bone to grow into it. There are different bearing options that are available today. In general, we usually pick between metal-on-plastic or ceramic-on-plastic bearings. For young and active patients, metal-on-metal resurfacing is a treatment option and should be discussed with Dr. Boettner if you feel that your activity level or age might require this procedure. Standard total hip replacements are done in our practice using a minimal invasive approach. Currently, there are two established approaches. One is the minimal invasive anterior approach, the other one the minimal invasive posterior approach. Both of these approaches have certain advantages and disadvantages. Dr. Boettner performs both of them and will discuss which one might be beneficial in your individual situation. Usually, a total hip replacement is done under spinal epidural anesthesia and you will stay in the hospital for approximately two or three days. After a rehabilitation period, which ranges from three and eight weeks, you can return to work and driving. We do recommend to limit high-impact sports after a total hip replacement. However, lower-impact sports such as tennis, golf, swimming, biking, hiking, skiing, golf and work outs in the gym are no problem after a standard total hip replacement. Total hip resurfacing has been around since the mid 1990s in its current version. It was developed out of the necessity that young and active patients showed unacceptable high failure rates after total hip replacement surgery and that total hip replacement, not in all instances, allowed them to return to their active lifestyle. Over the last decade we have seen an increasing number of patients that come, sometimes in their 30s and 40s, to undergo hip replacement surgery and do wish to return to almost unlimited activities after their total hip replacement surgery. Total hip resurfacing might be an interesting treatment option for these patients. It, instead of removing the femoral head of the femur and implanting an implant into the femoral canal, only resurfaces the head and allows the surgeon to add a cap on top of the femur, replacing the diseased cartilage. This procedure does preserve bone on the femoral side and allows reconstruction with a relatively large head diameter, which increases the stability of the joint and decreases the risk of dislocation, especially for patients that engage in sports like rock climbing or full contact martial arts. Hip resurfacing is a metal-on-metal bearing, which, in general, decreases overall wear and allows for repetitive high-impact sports with acceptable wear rates. However, metal ions can reach the blood stream and the metal ion levels in patients with hip resurfacing are usually increased. There is also the possibility that your body might react to metal ions and cause conditions such as fluid collections around the joint, synovial proliferations, or, ultimately, osteolysis and implant loosening. Because the incidence of these complications is higher in women, we currently do not recommend hip resurfacing for women. However, in young male patients, the risk of these complications seems to be in a range that is very similar to standard total hip replacement surgery within the first 10 years and, therefore, we do perform this procedure for patients that fit the indication criteria. Dr. Boettner will take time to discuss the pros and cons of resurfacing with you if you are interested in this procedure. He has, over the last six years, gained a significant experience in performing the surgery and has a large number of patients that have benefitted from this procedure. Dr. Boettner started doing hip resurfacings in December 2006.